Gorgeous Villa For Sale in Mallorca. 900.000€. Lies in the new part of santa ponsa with less than 5 minutes by car to the town center, the golf-courses and the sea! 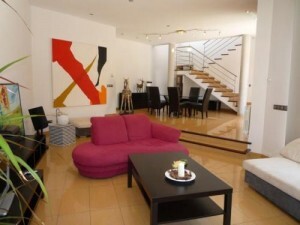 The villa is neatly situated in a cul-de-sac and borders on to a green area. 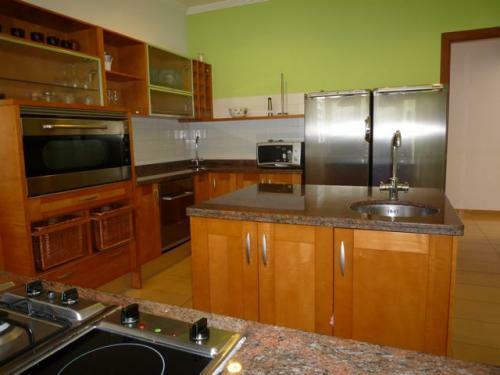 There are 2 floors, with the ground floor comprising the large and modern kitchen with an adjoining laundry-room. The kitchen has a door out to the back of the garden, to the dining-room and to the hall. In the guest wc is in this hall, which leads in to the open plan dining-room and on a slightly lower level, the living-room. There are large french doors letting in plenty of light and leading to the stunning wooden decked terraces that surround the pool. There are 2 double bedrooms that share a bathroom on this floor, one of the bedrooms have direct access to the terrace in front of the villa. Upstairs there is a double bedroom with access to its own large terrace and great views over the garden and to santa ponsa. This bedroom has its en-suite bathroom and built in cupboards. The master suite has a large walk in wardrobe and a beautiful large bathroom with a jacuzzi bath. 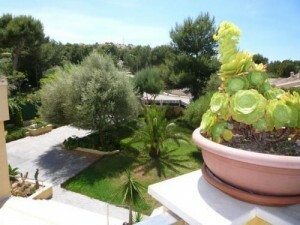 The bedroom has access out to its private terrace and views to the garden and santa ponsa, too. The floors in the bedrooms and the walk in cupboards are made of cherry parquet and the rest of the villa has porcelain tiles. The central heating is gasoil. In the garden is a 25 x 5 m football-pitch, a nice and cool back garden, which is also where the 2 car garage is situated. The front garden has a lawn, several olive- and palm-trees. The pool is built in a l-shape form and surrounded by a large sunbathing or dining-area. April 21, 2014 in MOVING TO SPAIN.